If you uncomment the top "render_part=7;" line and comment out "render_part=8;" the holes should render fine. It's only when they are diff'd out in the "dip_socket_alternating()" module that OpenSCAD dies. > I'm getting some segfaults on the following design at early Compile time. I'm not able to reproduce your crash here. I do, however, get a lot of "ERROR: Illegal polygonal object - make sure all polygons are defined with the same winding order. Skipping affected object." I assume you're using your own build. Could you give me a stack trace or smth. which could help pinpointing your issue? Also, some info about your build environment could help (which versions of which libs etc.). I'll take a look at what could cause the errors on my end in the meantime. When I get home I'll run it again on my Mac Mini using your _latest (64bit) image and send you the crash log. It was segfaulting there as well when I tried it, but perhaps something has been changed/fixed since. I worked around the problem by rendering the intersection() parts to unit-scaled STL and import_stl() instantiating them into the main design. >> I'm getting some segfaults on the following design at early Compile time. > I'm not able to reproduce your crash here. > I do, however, get a lot of "ERROR: Illegal polygonal object - make sure all polygons are defined with the same winding order. Skipping affected object." > I assume you're using your own build. Could you give me a stack trace or smth. which could help pinpointing your issue? Also, some info about your build environment could help (which versions of which libs etc.). > I'll take a look at what could cause the errors on my end in the meantime. > We are Elektropeople for a better living. 1) Rendering CSG: OpenSCAD hangs in CSGTerm::normalize() using > 2GB memory. 2) Rendering using CGAL: The polygon error happens immediately and no geometry is returned. Your model is a bit complex so it's hard to progress from there..
OK, more than 1.5 years have passed and this is still an issue. Simply put, OpenCSG cannot render more than one negative node at once. To work around this, we have to render A-(B*C) as (A-B) + (A-C) (aka. normalization). If you look at your design, this means that every intersection will have to be combined with every other negative object. Since you're having a fair number of intersections going, this makes the CSG tree explode in size. I have recently fixed some CSG tree normalization bugs, but this seems to be a hard limitation. I might of course be wrong - perhaps one of the OpenCSG gurus have an idea how to better deal with this. Anyway, as you also pointed out, your nut_blank() module can be rewritten not to used intersections. Other ideas are: cylinder($fn=6), or use a render() statement directly in front of the intersection. Also, I've now hard-limited the normalization to stop at 5000 nodes. This should at least keep OpenSCAD from crunching on the tree indefinitely or until the process crashes. Using render() has proven to be the most general-purpose approach to addressing this and similar issues. > OK, more than 1.5 years have passed and this is still an issue. > Simply put, OpenCSG cannot render more than one negative node at once. To work around this, we have to render A-(B*C) as (A-B) + (A-C) (aka. normalization). If you look at your design, this means that every intersection will have to be combined with every other negative object. Since you're having a fair number of intersections going, this makes the CSG tree explode in size. > I have recently fixed some CSG tree normalization bugs, but this seems to be a hard limitation. > I might of course be wrong - perhaps one of the OpenCSG gurus have an idea how to better deal with this. > Anyway, as you also pointed out, your nut_blank() module can be rewritten not to used intersections. > Other ideas are: cylinder($fn=6), or use a render() statement directly in front of the intersection. > Also, I've now hard-limited the normalization to stop at 5000 nodes. This should at least keep OpenSCAD from crunching on the tree indefinitely or until the process crashes. 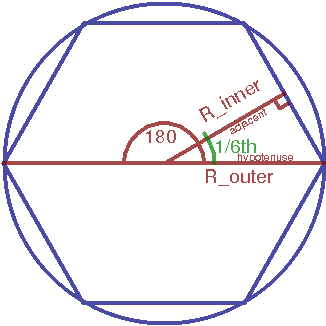 Speaking of cylinder($fn=6), could we somehow specify the inner radius? 2. I fire up qcad, and I draw the hexagon. I and others have requested an inner radius specification in the past. the case of $fn=6, I just use a ratio of 7/6. >> Other ideas are: cylinder($fn=6), or use a render() statement directly in front of the intersection. > Speaking of cylinder($fn=6), could we somehow specify the inner radius? > 2. I fire up qcad, and I draw the hexagon. > I and others have requested an inner radius specification in the past. > the case of $fn=6, I just use a ratio of 7/6. you can use any one of these parameters to specify the cylinder as required. This can be considered as a reference implementation to include into openscad. geometry if you're curious how I worked that out. > geometry if you're curious how I worked that out.